Omnifray is the game of your choice:- your choice how the story develops, your choice as a player of the background and abilities of your character and your choice as referee of how to interpret the game-world and its secrets, how to use the rules and what your monster can do. Omnifray is enormously flexible and packed with innovative ideas. It can be a challenging game to run or play; if you want the best in atmosphere, choice and a true-to-life feel, and a level playing field for all PCs, you can take that challenge! 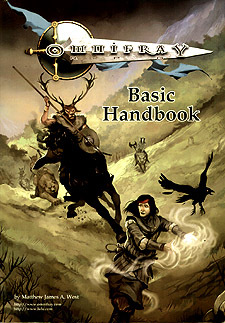 In this book is all you need to play:- world background, basic rules, legendary creatures, basic NPCs and a taster of the advanced rules, with magical powers for NPCs and feats of physical energy and concentration for player characters. Omnifray is meant for a mature audience.